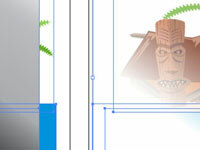 You can use opacity masks to make more interesting artwork in Adobe Creative Suite 5 (Adobe CS5) Illustrator. Create an opacity mask from the topmost object in a selection of objects or by drawing a mask on a single object. The mask uses the grayscale of the selected object as its opacity mask. Black areas are transparent; shades of gray are semitransparent, white areas are opaque. 1Open the Transparency panel menu. Also, be sure that the Blend Mode drop-down list is set to Normal. 2Create a shape anywhere on the artboard or open a document that has artwork on it. We’re using a circle, but the shape doesn’t matter. Make sure that the artwork has a fill. A solid color helps you see the effect. An opacity mask converts the topmost object into a mask that then masks out the underlying objects. 3Open the Symbols panel (choose Window→Symbols Panel) and drag a symbol to the artboard. In this example, we’re using the drums symbol. Using the selection tool enlarge your symbol so that it fills the shape. 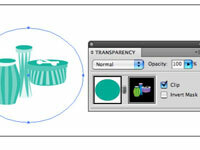 5Select both the symbol and the shape and then choose Make Opacity Mask from the Transparency panel menu. The symbol turns into a mask, showing varying levels of the underlying box of the newly created mask, depending on the original color value. To delete an opacity mask, choose Release Opacity Mask from the Transparency panel menu. Click the right thumbnail (which represents the mask) in the Transparency panel and a black border appears around it, indicating that it’s active. You can move the items on the mask or even create items to be added to the mask. The mask works just like the regular artboard, except that anything done on the mask side is used only as an opacity mask. To work on the regular artboard, click the left thumbnail.